Romania’s National Agency for Mineral Resources has granted Canadian explorer Carpathian Gold Inc. (TSX:CPN) a 20-year mining license for its Rovina Valley gold and copper project, strategically located about 20 km west of Gabriel Resources’ (TSX:GBU) debated Rosia Montana. This is first time Romania grants a mining license without the involvement of a state-owned enterprise. Carpathian’s stock soared on the news. It was up 200% to 0.0150 at 11:00 am ET. The Toronto based company, through its wholly-owned subsidiary, Samax Romania S.R.L., will now work on updating the Preliminary Economic Assessment of 2010, to provide revised project costs and evaluate scalability options, Carpathian said in a statement. The Rovina License lies within the Metalliferi Mountains, in the southern part of the Apuseni Mountains, in the area known as the Golden Quadrilateral, one of Europe’s most prolific mining districts for over 2,000 years. Aluminum (or aluminium) is the world’s most common metal by crustal abundance, making up 8.2% of mass. It’s more common than iron (5.6%) and a whopping 1200x more abundant than copper. Despite its prevalence, aluminum was not isolated all the way until 1827. This is because it occurs only in compounds, and never in a free form. It also turns out that removing aluminum from these compounds is quite difficult, and an inexpensive process wasn’t discovered until 1886 by a college student in the United States. Charles Martin Hall was interested in the problem, and ran an electric current through a molten mixture of cryolite and aluminum oxide in a wood shed behind his house. That dropped the price of aluminum drastically, and it became a household metal. Behind iron, aluminum is now the second most used metal in the world. Aluminum can now be found in everything: transportation (planes, cars, and more), buildings, machinery, consumer durables, packaging, and electrical uses. 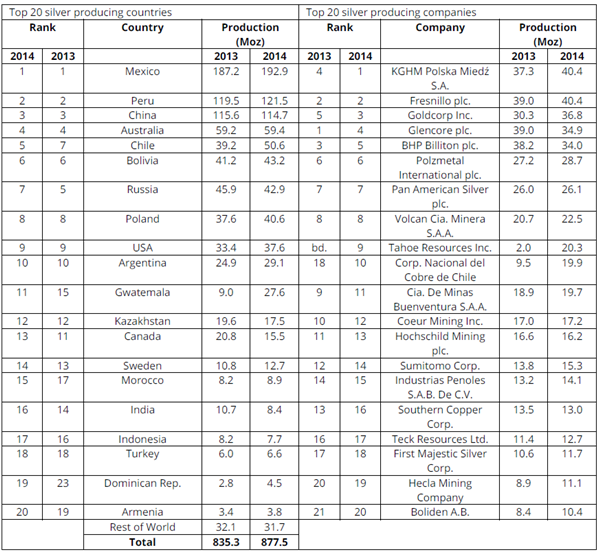 [News release submitted by KGHM] – KGHM has regained its first position in the world’s silver production. Thomson Reuters’s analysts have recently compared results of all leading producers of this metal. In 2014, KGHM produced 1,256 tons of silver, which is 7 percent more than in the previous year. The World Silver Survey is one of the key annual reports on silver and the only to rank all producers of this metal. The survey is prepared by the GFMS team of global metals market analysts at Thomson Reuters. It is a synthesis of the silver market’s key indicators, comprehensive statistics and in-depth economic analyses. Information in the report is based on financial figures published by companies and interviews with their representatives. This allows for reliable data on the global silver supply and demand to published in the report each year. “It took us one year to regain our leadership position in the silver market. In 2013, we were ranked as third silver producer. In the previous year, however, we raised production by 7 percent due to optimum ore processing and smelting activities,” said Herbert Wirth, President and CEO of KGHM. Poland was ranked in the eighth position as the largest silver producer. The report is prepared in co-operation with Silver Insitute. It has been published since 1990, which means it is the 25th jubilee edition. You are currently browsing the www-Global Commodities.com blog archives for May, 2015.